Afternoons are hard. Everyone is tired, and trying their best to transition from morning to evening, from resting to ramping up their energy again, or in my case, from folding clothes quietly to cooking dinner with three kids underfoot. I’ll be honest: some (many) days when the kids get up from their afternoon quiet time, they get to watch TV. I try to keep it to every other day, but it’s kind of a seasonal thing. In the summer it’s less, in the winter, it’s more. But some days, the attitudes are especially shoddy, making me more aware of my children’s need for time with me. And I feel that tug: how do I give these children anything when at this point in the day, I’m running on empty? The answer? Cookies and books. One of my favorite book mom mentors, Sally Clarkson, often says it’s important to bring your children into the activities that you enjoy and that feed your soul. I love that concept – we as moms can be nurtured and nurturing at the same time. Sometimes I remember that, and sometimes I have the wisdom and energy to do things a little differently in the transition hours, more commonly (and accurately) called “the witching hours.” I lay out some real plates and glasses on the table, get some cookies from the freezer and stick them in the microwave (or graham crackers if the baking hasn’t happened in a while! ), and pour milk in fancy glasses. Then I go to the kids’ room a few minutes before their quiet time timer dings, and whisper, “Come to the kitchen!” Sometimes we have a little bit of hot herbal tea with honey instead of milk and cookies. Sometimes we’re finishing up some lemonade or cake from a family birthday party. Whatever the food is, along with it is always a book. This time is for a book I choose that I know will feed their minds. Their small hands are busy with their cookies, but their minds are taking it all in. When we come together at the table, all of the bickering, busyness, and mess of the day is suspended for a few minutes. I love these times at the table. They bring the things I like doing – reading books, eating cookies, and spending happy time with my children – all together. We all get what we need, and it’s always worth the few extra dishes or the lost productivity because the children feel loved and cared for and able to cope with the rest of the day, and so do I. I wish I did this cookies and books time every day! That’s not a reality right now. But I cherish the times when we’re able to set everything else aside and pick up a book, a cup, a story, an idea, a love of learning, and a love for each other. Not everyone likes books and cookies (okay, everyone probably likes cookies). Maybe you love to run. Maybe you like scrapbooking, cooking, walking, or maybe what you love above all else is window shopping. My kids and I sometimes make up silly stories together. Whatever it is you like to do, maybe try doing it with your children? It gets really hard to do the things you love as your children take more of your time, but it helps you all to speak the same language later in life if you share what you love now. Your favorite activity won’t be the same when you bring your children into it with you, but it will be better than nothing! Choose your Cookies and Books – whatever you like to do together- and make it happen once in a while! You’ll be glad you did. Rachel and Obadiah – We loved Obadiah the Bold, so we had to track down other books by Brinton Turkle about Obadiah. However, this one was more about Rachel. Where Obadiah was great for a little brother, Rachel and Obadiah is great for a little sister who feels the need for some appreciation. The illustrations are so lovely, and it’s fun to read the Quaker wording. Isaac was not as big a fan of it because the girl is the winner in the end, but Ella liked it a lot. 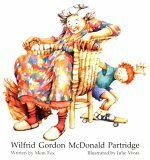 Wilfrid Gordon McDonald Partridge – Mem Fox is an famous children’s author with whom I am sadly unfamiliar. I enjoyed my first experience of her books this week! This book made me want to cry a little, because my kids have a great, great aunt who is exactly the age of the woman in the book. Wilfrid, the little boy, thoughtfully gathers all the things he thinks will help her find her memories again, and the result is very touching. That was my take on it, anyway! When I got done reading it to Isaac and Ella, Ella’s response was, “Well. That was a weird book.” So maybe don’t expect your kids to love it. But it’s a sweet book that could aid in discussion about elderly family members whose memories aren’t what they used to be. The illustrations by Julie Vivas keep things lighthearted and fun. What books are you reading with kiddos this week? What a creative and loving idea! !Your ways of caring for and giving yourself for your family are inspiring and remind us that our God is Creator and there is great potential within each of us to be creative. I am just discovering Sally Clarkson , reading her book Own Your Life. Amazing woman and an amazing walk with the Lord! A great mentor!